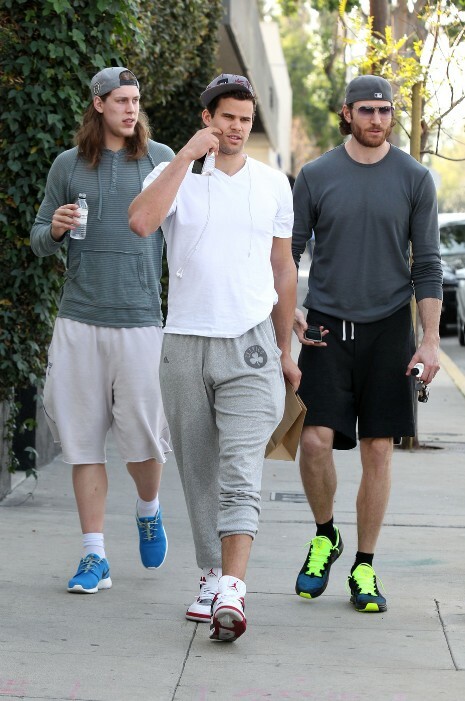 Kris Humphries is pictured above walking in Beverly Hills with two extremely tall friends. The Boston Celtics forward has put his 72 day marriage to Kim Kardashian totally behind him and doesn’t want to be reminded of it. Recently Kim had a skirmish with a foul mouthed teen in Beverly Hills and Kanye West came to her rescue and punched the guy. Later Kim said she was proud that Kanye stood up for her and implied that Kris wouldn’t have done the same. But Kris chose to ignore the comment and continue his happy life. Alec Baldwin: Don’t Give Up – Get A Grip! SACHA BARON COHEN WILL ROCK YOU!